This Winter, Australian and New Zealand dancers have the opportunity to learn from two of the best. Alexandra Cownie, author of How To Be a Ballet Dancer, is bringing two world-class teachers to the International Ballet Workshops, in nine cities across Australasia. Returning for the second time to the Workshops will be Mr. Jacques Marsa, a former dancer from the Paris Opera Ballet and an internationally sought-after ballet master. “His classes in January were immensely successful and we really look forward to having him around again – and for the last time – this winter,” says Alexandra. International Ballet Workshops students in Sydney with Alexandra Cownie and Jacques Marsa. Photo courtesy of Alexandra Cownie. Mrs. Dominique Genevois, a former soloist from the Bejart Ballet Lausanne, will be visiting Australia for the first time, running classical ballet classes as well as Bejart repertoire. She will also be offering a full scholarship to the National Conservatoire of Lyon, France. Open to dancers aged 8 and up, the Workshops take place in Melbourne, Brisbane, Tamworth, Gold Coast, Auckland, Canberra, Sydney, Perth and the Sunshine Coast between late June and early August. We asked Mrs. Genevois a few questions about the Workshops. What are you looking forward to about your first trip to Australia? What repertoire will you be teaching? 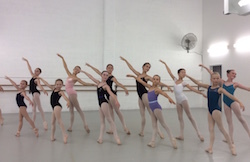 International Ballet Workshops students in class. Photo courtesy of Cownie. In regards to the scholarship, what will you be looking for in a potential student? “The decision to give a scholarship to an Australian or New Zealand student will not only be mine but a joint decision with our artistic Director Mr. Jean Claude Ciappara. The students are normally selected through a very difficult audition with 350 students applying and only 24 selected across the ballet and contemporary sections. Our training is over 4 years. The last year is ran as a Youth Ballet pre-professional year where the students tour around France and sometimes overseas, just like a professional company. This is a great preparation to the professional world still in the school environment. If I meet this winter a young girl or boy with the right abilities, we will send their video to the director as a private audition to join the school as an ‘auditeur libre’ (‘free student’ in comparison to the students following the entire curriculum of studies over 4 years). This student must be over 18 years old and with already a rather polished technique. If I meet a younger dancer (16-17 years old) that wishes to join the school, they will have to attend the audition, however I can tell them their chances of being accepted into the school, as I know very well the profile we research in our students. The audition lasts three days and is very challenging. 1st selection: After a day of ballet and contemporary classes; 2nd selection: Performance of an imposed solo taught the day before to the selected students. International Ballet Workshops students stretching. Photo courtesy of Cownie. In your opinion, what are the key qualities a dancer needs? As a dancer, what were your favourite roles or ballets? “‘L’elue’ from the Rite of Spring by Bejart, this was my favourite role but I also loved dancing ‘les partisans’ in the Firebird, ‘Sonate à 3’ and ‘Marianne’ in Gaité Parisienne. In classical, I would have loved to dance the role of Odette/Odile because I love the duality of that role. As a spectator, I love watching the works of Jiry Kilian, Mats Ek and Forsythe. What advice can you give to Australian dancers aiming for an international career? Dancers are encouraged to register, and find more information, at www.InternationalBalletWorkshops.com. Photo (top): International Ballet Workshops. Photo courtesy of Alexandra Cownie.